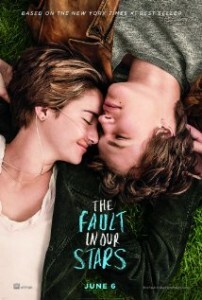 Summary: Hazel and Gus are two teenagers who met and fell in love at a cancer support group. They share an acerbic wit, a disdain for the conventional, and a love that sweeps them on a journey. As a thirties something male I probably am not the target audience for The Fault Of Our Stars. I can let me re-phrase that I AM CERTAINLY NOT THE TARGET AUDIENCE for this film. But some credit has to be paid to director Josh Boone (Stuck In Love) because despite the fact The Fault Of Our Stars is actually aimed for the female of the species it seems like Boone has realised that more than a few males will be dragged along to see the film so he has also set about trying to make the film accessible and enjoyable for them as well. Based on the popular novel by John Green The Fault Of Our Stars centers around a young cancer patient by the name of Hazel (Shailene Woodley – Divergent, White Bird In A Blizzard) whose battle with cancer has left her with severe breathing difficulties. Still she tries not to let life bring her down too much. She finds solace in her favourite novel which also tells the story of a cancer patient but also finds life is a bit of an up-hill battle due to the fact that her parents, Frannie (Laura Dern – The Master, Little Fockers) and Michael (Sam Trammell – Me, Things People Do) seem more determined to make her attend therapy groups rather than life her live like a real teenager. But it ends up being one of these groups that changes Hazel’s life forever. While attending one she meets Gus (Ansel Elgort – Divergent, Carrie) and his best friend Isaac (Nat Wolff – Behaving Badly, Palo Alto), both of which are cancer sufferers themselves. Gus instantly has a romantic interest in Hazel and also helps her to try and take chances with her life, including travelling to Europe to meet Van Houten (Willem Dafoe – Bad Country, The Grand Budapest Hotel) to ask him about what she feels is missing from his novel. As a film The Fault In Our Stars certainly has a lot of plusses. Given the subject matter at hand there was a real danger that in the wrong hands this could have become a ‘lunchtime television weepy’ but Josh Boone certainly tries to make the film a lot better than that. He tries to tap into that similar style and language that worked so well in Juno and while it works throughout the film there are at times when the audience feels like they are severely manipulated into being made cry. For some reason though this is a film that keeps working despite its few flaws. The characters are so damn likable that you can’t help but care what happens to them. Then there is the fact that there are some characters that go so far beyond what you would expect from a Hollywood film that it almost takes this film into a whole different realm. Take the character of Van Houten for example. Normally when teenage characters meet their hero in a film it’s enriching experience with the hero normally spouting wisdom. But here Van Houten is almost the anti-hero, here he is as far removed as Yoda as possible with his alcoholic ways, abusive persona and the fact that he can randomly swing into a rendition of Swedish hip-hop. It’s these ‘not-sure-what-to-expect’ moments that will keep the audience tuned into The Fault In Our Stars. The film also reiterates that Shailene Woodley is Hollywood’s ‘it’ girl at the moment. It is seriously coming down to the question of is there anything that girl can’t do? From action heroine in Divergent to a witty cancer patient in The Fault In Our Stars the roles couldn’t be more different, yet somehow this talented young actress manages to pull off these roles with ease. Then there is Ansel Elgort, a virtual unknown who is mainly known for playing Woodley’s brother in Divergent, a small part to say the least. But here he is a real standout, revealing himself as a witty talented actor who could be now rivalling Miles Teller for acting roles. When it comes to the older members of the cast Willem Dafoe is his usual brilliant best, however Laura Dern seems to struggle a little in an over-written part. While some movie goers may be scared off by The Fault In Our Stars it is a film that is well worth a look. Just be prepared to bring the tissues out.